Laurent Paucot a french throat-singer, who visited Tuva summer last year and was awarded the title "Discovery of the Festival Ustuu-Huree", was so carried away by Tuva ad this visit that started an interenational project related to this beautiful place in the very centre of Asia. 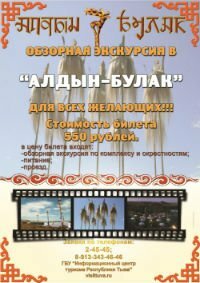 He invites everybody interested in this prject to contribute to it: During the festival, I met Galina Munzuk, the daughter of the famous actor in Tuva, Maxim Munzuk. He played in the KurosawaЂs film "Dersou Ouzala" in 1976. Since October 2003, IЂm doing a research about her father. He went to France in 1976 and 1987 to many festivals to present the Film to the French public. I started to collect articles and pictures from newЂs papers and cinema magazins published in 1976 during the film festival of Paris. Unfortunately Galina Munzuk and the people of Tuva never had access to all these documents.